Jennifer Conole, Transition and Relocation Manager, at a Hiring Our Heroes event. 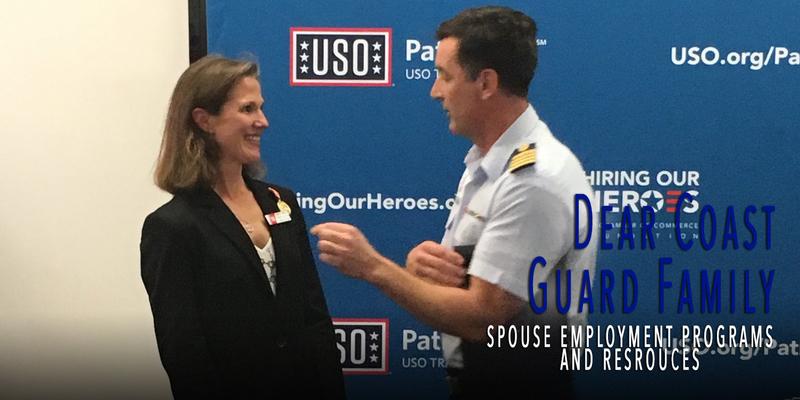 If you’re a Coast Guard spouse seeking employment, there are a variety of programs and resources to support you. Through the Coast Guard’s Health, Safety, and Work-Life Spouse Employment Assistance Program, Transition and Relocation Managers (TRMs) provide spouse employment assistance in a variety of ways, but most importantly they have the ability to engage individually with spouses and family members on their unique career goals. TRMs can provide assistance with developing resumes and LinkedIn profiles, preparing for interviews, and providing referrals for local employment resources like job fairs, professional networking events, labor market information, workshops and more. CG SUPRT also provides career services to facilitate the career planning and job search process for spouses. CG SUPRT career counselors provide assistance with career exploration, networking, resume development, self-marketing, interviewing, salary negotiation, career management and more. To access this service, please visit CG SUPRT’s website at www.cgsuprt.com (password: USCG) or call 855-CG-SUPRT (247-8778). Hiring Our Heroes | Military Spouse Program: Hiring our Heroes offers a variety of resources to support spouse employment, including hiring and networking events across the country, transition summits, and a Military Spouse Professional Network that provides military spouses with career development and networking opportunities in military communities around the world. Hiring our Heroes has also developed a digital experience for military spouses looking to advance their careers – spouses can build a skills-based resume with Career Spark, network through regional LinkedIn groups, get career advice from a mentor or expert through eMentor and more. MadSkills creates virtual work opportunities for military spouses – allowing spouses to work wherever they are.